A few days ago we posted about the upcoming Miami Watch Company crowdfunding campaign for Katana, a new collection of watches inspired by the craft of forging samurai swords. Four models, each one named after a Tenka-Goken, or the “Heavenly Samurai Swords”: Dojigiri (童子切), Onimaru (鬼丸), Mikazuki (三日月) and Juzumaru (数珠丸). 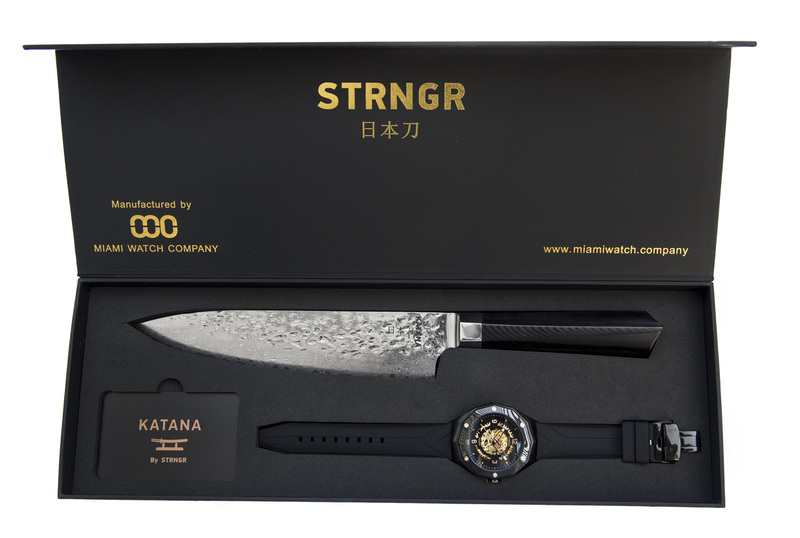 Their bezel is made from Damascus steel, making each Katana a one-of-a-kind watch and the fun just continues, as each watch is delivered with a high-end chef knife made of 77 layers of hand forged Damascus Steel and G10 organic handle. As of today, the crowdfunding campaign for the Katana collection is live on Indigogo, with deep discounts, prices starting at $188, if you catch an “MWC insider” package that will include besides the Katana watch and knife, an extra Stranger watch. For more details about this interesting watch collection and options to reserve, click here.